Prominent & Leading Manufacturer from Ahmedabad, we offer horizontal steam boiler. Our organization has gained recognition as an affluent manufacturer and supplier of Horizontal Steam Boilers which are used in various industries. This product is widely demanded for quality features like high efficiency, accurate dimensions, robust construction and long service life. The offered product is designed and manufactured by our experts using exceptional quality components in compliance with the set industry norms. 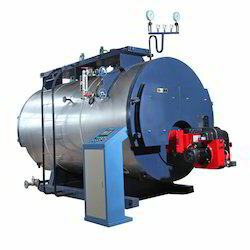 Our clients can avail these Horizontal Steam Boilers in varied sizes and specifications at the most effective prices. We also offer maintenance and installation services to our clients. 1. After checked and accepted eligibly, the boiler can leave factory integrally for installation, debug and use easily. 2. It runs automatically. Burning, water level, temperature and steam pressure are adjusted and protected automatically. 3. The mobile front and rear smoke case is convenient to repair and keep boiler. 4. The international first-class burner guarantees thermal efficiency and improves integral quality. 5. Enough steam storage house and heating surface makes the boiler produce high-power, high-quality steam. 6. Water-cooling room is designed integrally to improve thermal efficiency and prolong boiler's use life. 7. Various high-quality boiler fittings guarantee boiler works in normal. 8. Wave-type hearth and large burning room make it have good thermal flexibility. This series smoke boiler can improve boiler's efficiency, save fuel, reduce cost greatly to reach the aim of high-performance, oil (gas)-saving, safe boiler. This series boiler has more humanized, safer automatic intelligent control system. WNS oil/gas steam boiler has the advantages of high efficiency, saving energy, environmental protection, easy maintenance, wear resistance and so on.